So far, most of the results from the Cassini mission have been scientifically interesting, but, well, not much to look at. Most of the photos have been black-and-white. However, today JPL put up a color composite that deserves some kind of award for science photograph of the year. Whoa. And again I say, whoa. This definitely belongs in the “amazing things simple physics can do” category. For the higher resolution version and the caption, see the main body of the post. Here is a bigger version. 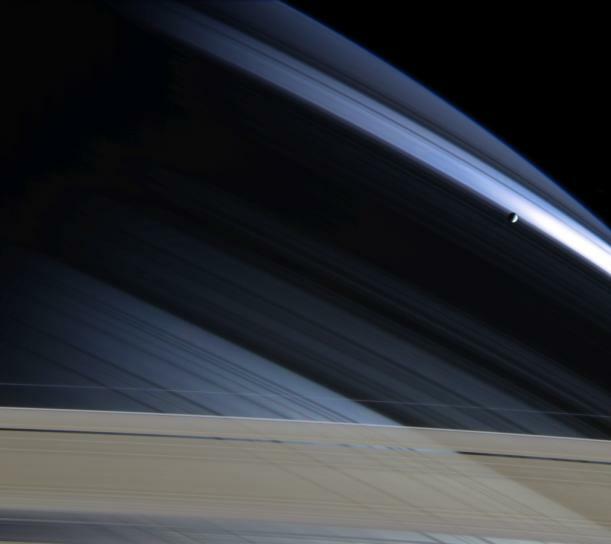 Original Caption Released with Image: In a splendid portrait created by light and gravity, Saturn’s lonely moon Mimas is seen against the cool, blue-streaked backdrop of Saturn’s northern hemisphere. Delicate shadows cast by the rings arc gracefully across the planet, fading into darkness on Saturn’s night side. The bright blue swath near Mimas (398 kilometers, or 247 miles across) is created by sunlight passing through the Cassini division (4,800 kilometers, or 2,980 miles wide). The rightmost part of this distinctive feature is slightly overexposed and therefore bright white in this image. Shadows of several thin ringlets within the division can be seen here as well. The dark band that stretches across the center of the image is the shadow of Saturn’s B ring, the densest of the main rings. Part of the actual Cassini division appears at the bottom, along with the A ring and the narrow, outer F ring. The A ring is transparent enough that, from this viewing angle, the atmosphere and threadlike shadows cast by the inner C ring are visible through it. The Cassini-Huygens mission is a cooperative project of NASA, the European Space Agency and the Italian Space Agency. The Jet Propulsion Laboratory, a division of the California Institute of Technology in Pasadena, manages the Cassini-Huygens mission for NASA’s Office of Space Science, Washington, D.C. The Cassini orbiter and its two onboard cameras, were designed, developed and assembled at JPL. The imaging team is based at the Space Science Institute, Boulder, Colo. The photo is archived at the NASA image catalog here. This is only one of the many recent close-ups of Saturn’s moons that were taken in late October. Also check out the best-yet global composite of Titan’s surface. And remember, only 13 days until the next Titan flyby, and soon after that – on December 25, uncoicidentally – the Huygens probe separates from Cassini for a 21-day journey to drop into Titan’s atmosphere. Here’s the schedule, more schedule, and the plan. It would be quite some Christmas present if that goes off without a hitch.